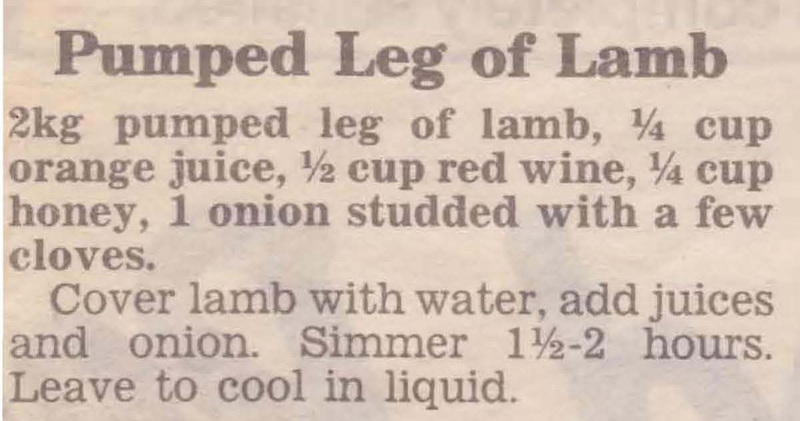 Hunting through Mum’s recipes I found this Pumped Leg of Lamb recipe and it’s brought back lots of memories. Ham when I was a kid only came in cans and even then only on special occasions. On the other hand lamb was readily available and cheap and Mum always made it to have as cold meat a Christmas time. When cooked it had a vague ham look, taste and texture. This recipe was printed in the Herald Sun in, I think, the 70s, I don’t have Mum’s original recipe, but I’m sure it didn’t have red wine, orange juice and honey in it, Mum’s was a much plainer version. Pumped Leg of Lamb is similar to corned beef. You can’t buy it off the shelf these days, but I’m sure a butcher would be prepare it for you, like corned beef the lamb is pumped with brine and you cook it the same was as corned beef. Not sure if you want to try it out, but it does bring back lots of memories to me of cold meat and salads on hot Australian summer days. This entry was posted in All Recipes, Lamb, Main Dishes and tagged 1950s, cloves, corned beef, honey, lamb, orange juice, pumped leg of lamb, red wine by bebsrecipes. Bookmark the permalink.